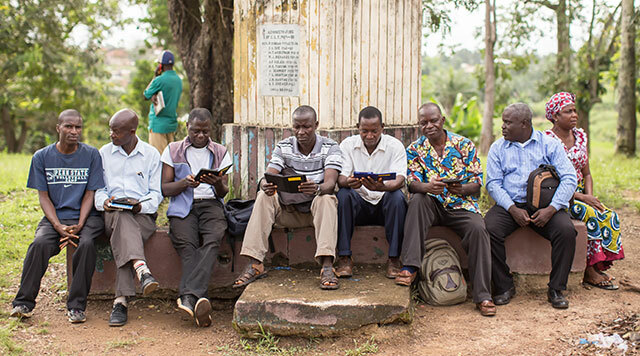 NASHVILLE, Tenn. -- A pilot project to provide e-readers loaded with theological texts for a seminary in Liberia has proved so successful that additional funding is being sought to expand the project to other seminaries in Africa, including Africa University, Kamina Methodist University, Kabongo Methodist University, and several others. The goal of the original project was to raise $30,000 to buy 100 electronic books and texts for professors and students at the Gbarnga School of Theology in Liberia. The students and professors no longer spend precious time and money copying texts and making notes from scarce textbooks. Students at the Gbarnga School of Theology in Liberia study with e-readers supplied through the General Board of Higher Education and Ministry (GBHEM) and the General Board of Discipleship. Photo from GBHEM. Once the $30,000 goal was reached, fundraising efforts continued and more than $70,000 has been pledged to support implementing this project in other parts of Africa. The pilot project was funded by the General Board of Higher Education and Ministry (GBHEM) and the General Board of Discipleship (GBOD). The United Methodist Publishing House provided select texts that were loaded into the e-readers. Amos Nascimento, GBHEM’s special assistant for Global Education and New Initiatives, said the general agencies provide technical assistance and support. “This campaign involved members of the boards of directors in the two agencies, boards of ordained ministry, annual conferences, local churches, individual donors, universities in Africa, faculty and the students – who also contribute to the process by paying $30 to acquire the e-readers. For all these reasons, this project has been a great success and can be expanded,” Nascimento said. The project not only funded new technology directly to users, it also involved working with faculty to identify key texts that matched the curriculum they needed in that school, according to Rev. Stephen Bryant, GBOD’s director of Discipleship Resources International. He added that the use of e-readers can potentially bridge an important gap that still exists in theological education in Africa. GBHEM has invested in online education and technological infrastructure for Methodist-related universities and theological seminaries in 12 African countries, focusing mainly on the provision of computer labs, access to the Internet, generators and other equipment that can be installed at institutional settings. To learn more or to donate online, visit drint.org/donate. *Vicki Brown is associate editor and writer, Office of Interpretation, General Board of Higher Education and Ministry.